If plaster is good.....paint is better! Screen-only did not last long! Looks better with tape off! Overall scene view, ready for water soon. Little pink triangles.....for you and me! Painted over the embankment and Homa-Bed. Port of Erin trackage mostly cut and in place! Alternate view of Mid-City Scrap, etc. Left side of left side! Higher view of "boomerang insert"
New embankment on the left! Vertical shot, looking in from staging. Close up of crossing in pavement. Initial implementation of Colfax, Inc.
More views of painted fencing. Piping and brackets cut and filed flush underneath, and painted. Added cars to local, mainly displaying the grass! U-23C 6915 on a nice sunny day at Hammill Yard. Close-up showing tank car loading pipe and "hoses"
See if you notice the difference from the previous picture! Front view for Mike C.! New Real Estate is always good! Clamped while adding a shim for proper leveling. Weird left hand bracing close-up. Various grain terminal elevator mock-ups. How the pipes will "nest"
Mid-City Scrap gets a new sign! First view of my new brass railings! Duct cover side in place. What I had to cut out! The New England Meet Boys visit! Close-up, yes the heights match, different profiles on rail! 30-yr. old Baltic Birch plywood--the best! Triumphant wave of hand from view port! And now it's all cut out! View of West Yard and plant sub-roadbed in distance. Roadbed on top of sub-roadbed, all cut out. Continued progress on "Robinson's Crossover"
East Yard--first locos and cars! The wood ties and tie plates are killer! Rear main hidden from view by "lump"
Inner turnouts now in place! First switch at East Yard! Close-up of Meshoppen and future river bank. Constant trying and fitting for accuracy! Another view of the Jim Lincoln Track Laying Machine at work! 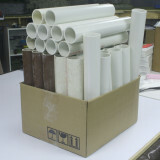 After the glue has set, the completed assembly is ready for installation. Another view of completed West Yard trackage. Of course I had to see it with the bridge in place! Time to patch the holes! Hot glue fastens all the pieces firmly and easily,. What a difference "opaque" makes! I really like the new contours here. Compare this to earlier views. All track in this view live and usable. This industry soaks up a lot of cars! Meshoppen with all tracks in place and powered! Alternate view of Meshoppen with all tracks in place. Things look so much better with real dirt! All screen complete, ready for plaster cloth! Formers in place at the "cut"
Overall end view of the peninsula showing a hard day's work. View looking through the cut. Culvert being glued in place. 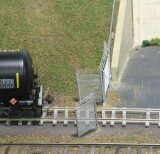 Elevated shot showing the foam formers between Kintner Milling and the main line. Alternate view of Meshoppen, ready for screen and plaster. Meshoppen Kintner to main line formers, different view. View of future Mehoopany Creek, showing relationship to foreground "cut" hillside. Meshoppen view of treed hillside. Culvert ditch ready for screen wire. Ditch with plaster as well as brown Sculptamold covering. 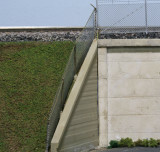 Culvert mouth with plaster and colored Sculptamold in place. 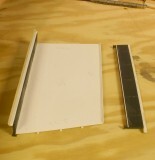 Styrene fascia insert, in place. Close-up showing clamping and bracing used. Port of Erin left side with finished fascia being glued in place. Most tiles glued down, gluing the tiles to the pop-up hatch. The Cider Mill Office has arrived! This view is from near the cut between Mehoopany and Meshoppen. Foam glued and ceiling tile cracks filled with Sculptamold. Sculpting of terrain extended towards the foreground. Removable hatch now painted and sealed. Foam transition piece with added green ground cover. 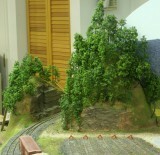 Ground cover and dirt road added next to Kintner siding at Meshoppen. Footprint of Mehoppany plant designed. Cardboard mock-up in progress. Note cars inside building. Alternate view showing entire facility mock-up. Coffee can used as future tank stand-in. Alternate view of shipping side of plant. Tank cars on newly designated sludge track. Low angle view of shipping/warehouse and Cider Mill Office. Alternate low angle view of shipping and warehouse area. Another low angle, more central view. Mehoopany Creek needs a bridge! Like I said, there were a lot of them to build! Ballasting and scenic materials make a huge difference. West yard and the sidings up to the paving and grade crossings now ballasted. I used a hot knife to take about half an inch off the foam risers. Rock temporarily tried in place. Adding more trees and shrubs. The roof is not glued on yet, but once it is, I'll be adding corrugated metal along the top where you see white. Building so far in place on the layout. It's shaping up! Slightly different view of railroad receiving side. Left side view of roof cap in place. Cider Mill Office has moved! Warehouse with ballasted tracks, grade crossings fixed up too. Dave & I both think this location makes more sense. Some of it was even left over from previous remodels! Close up view of the track just inside the tunnel. Wait--what happened here? Where's Laceyville?!! Nice to be rid of that big hole! This shot specifically for Mike Confalone! Support legs in place, removable bench piece in front of Well Trol installed. Uh oh, where is this? Looking up at the track that is to be lowered, against the wall. Complex under there! Another look at the underneath of the to-be-lowered sub roadbed. Old sub roadbed now aligns with Tunkhannock plywood! Removed foam to get to the actual bench work. Looking through the shelving from the sink area, at the eventual destination of the new bridge. Hing side plywood cut out. Filler piece cut and in place. New right of way to drop bridge, seen from sink location. Old "Grainzilla" road and ground cover cleared for new track coming off bridge. Underneath view of 2x4 hinge side supports. Vertical grain fir piece before trimming to length. Using bridge "land" plywood to mark fir piece for trimming. Ready to screw it all together and mount the hinge! A 2" cleat reinforces the bridge and the new roadbed through the shelving. Latch side and how the roadbed is attached. Track across bridge onto the "mainland"
Full main line cut and fit!